Trample your enemies under iron-shod hooves with the Knightly Retinues in Warlords of Erehwon! These paragons of chivalry are foes to be reckoned with! Here we have a list of chivalry and high romance, of brave knights and sturdy yeoman, faithful retainers, the devout and the good. Like the majority of our lists, it is broadly drawn and takes its inspiration both from medieval history, historical fiction, and fantasy fiction that draws upon these themes. It will, therefore, serve to give us the Knights of the Round Table – though whether Mallory or Monty Python we leave up to you. The warband described by this list comprises human warriors divided into two not-necessarily-equal camps: the ‘haves’ representing our nobles, the knights and their masters; and the ‘have nots’ in the form of retainers, yeoman and peasants. The knights are powerful warriors whether fighting on foot or mounted on fearsome warhorses, clad in heavy armour and wielding lances, huge swords and warhammers. makes this blue-blooded individual your top choice when it comes to dispatching troublesome monsters. 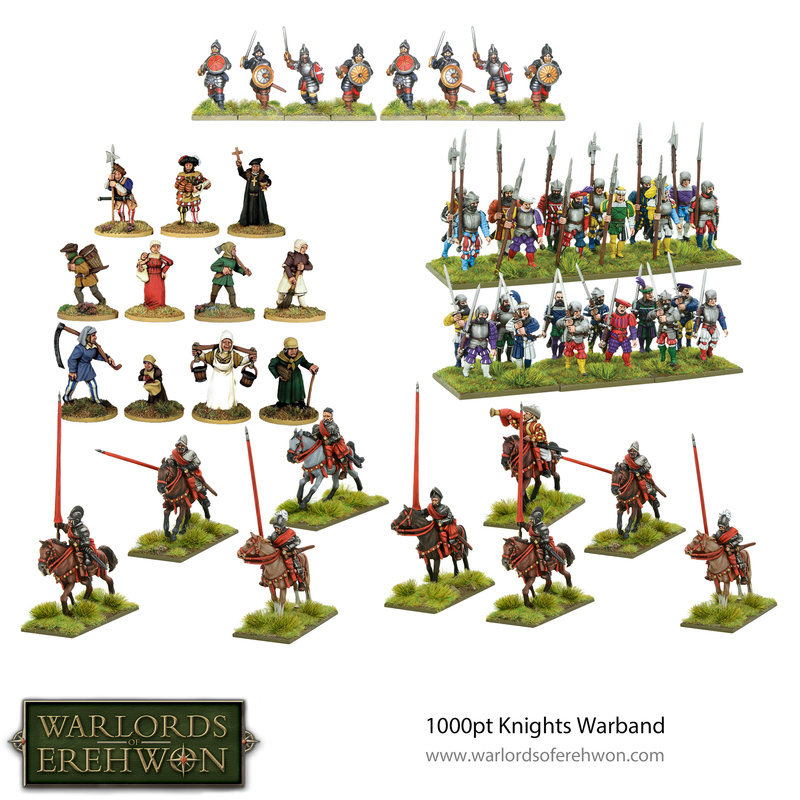 Although you are welcome to fill your warband’s ranks with the aristocracy, such a warband would be embarrassingly small, and who would do all the fetching and carrying? Better to give your nobility some essential support. Retainers are professional troops in the employ of their betters. They can be mounted or on foot and commonly armed with spears or other pole-arms. Archers and crossbowmen provide long-range support, whilst when it comes to numbers the peasantry gives excellent value for your points. In addition, we have included religious fanatics in the form of flagellants, who get the entertaining option of bringing a flaming wheel to battle with them. Sorcery and spiritual devotion do not necessarily sit comfortably in a knightly warband, but we make provision for a court wizard in the tradition of Merlin: apprentices and familiars provide some protection against sword blades and arrows! Players might prefer to field a priest, saint, or some such holy type in the guise of a wizard, and they are welcome to do so. available in small and large sizes and ideal for dislodging your enemies from their towers and keeps. We’ve put together this fantastic bundle using miniatures from our Pike & Shotte range to paint a different picture of the Knightly Retinue. The baroque, gothic lines of the early renaissance present an interesting and colourful aesthetic for your army! The post Spotlight: Knightly Retinues in Warlords of Erehwon appeared first on Warlord Games.